In 2003 an Australian became the youngest person ever to win a 400m hurdles world or Olympic title, her name was Jana Pittman and she was 20-years old at those Paris world championships. The event also helped her focus on the hurdles, as prior to that she had described herself as a handy 400m runner with half a notion at hurdling and had even won both the 400m and 400m hurdles at the 2000 world junior championships in Santiago, Chile. Coached by 1988 Olympic 400m hurdles champion Debbie Flintoff-King and her husband heading toward the 2004 Summer Games in Athens, Pittman suffered a knee injury that required surgery a week before the Games began, sparking a media frenzy on whether she would be ready or not. In the event she did indeed take part and after a bright opening 300m in the final faded to fifth. A further injury, a stress fracture to her back, then saw her miss the 2005 world championships at Helsinki. 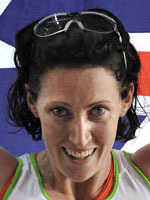 Events in her personal life shrouded the sports side of things around this time in her life as Australian media made much of a tiff between Pittman and teammate Tamsyn Lewis, sympathies falling on Lewis's side. More happily she met, married and had a baby boy with her coach British hurdler Chris Rawlinson and also relocated to Britain, returning to the athletics fold just in time for the 2007 world championships at Osaka. Out in Japan, now competing under the name of Jana Rawlinson, she beat Russia's defending champion and world record holder Yuliya Pechonkina into second spot to win in 53.31 seconds, she was still just 24 and looking confidently to the future. "If I can win this year after eight months (of motherhood), then next year is going to be very exciting," she said from Osaka.